Are electric bikes catching on in United States? GREEN VALLEY, Ariz. - Hal Mansfield bought his electric bike about two months ago and already is seeing savings. When knee problems threatened to keep Hal Mansfield from riding his bike, he started looking for a solution that would keep him on the road but wouldn't be quite as rigorous. "I had knee problems so I had to give up my other [traditional] bike," said Mansfield, 80, a Green Valley resident since 2005. "I still wanted to use a bike." He found what he was looking for in an electric bike, called an e-bike. He purchased a Chinese-made six-speed e-bike two months ago for about $850 from a local dealer and is using it almost daily. An electric bike begins with a traditional pedal bicycle that has an electric motor, a battery, and a controller for the electric components. E-bikes can come in different speeds and styles, there is even a three-wheel model and a recumbent model. 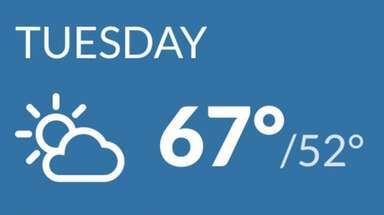 "It will typically go 15 to 20 [mph]," Mansfield said. "The farthest I have gone is about 15 miles [on a charge]." Mansfield has hopped aboard a trend that took root in China in the late '90s, when about 150,000 e-bikes sold there. In 2011, that number shot up to 25 million, according to The Wharton School, University of Pennsylvania. China is leading the e-bike trend with around 120 million on the road, followed by Europe with around 3 million and the United States at around 1 million as of 2010, the latest numbers available, according to The New York Times. In 2012, BMW debuted an e-bike that can be recharged in one of its new electric cars. E-bikes have been on the market for quite a while. Wal-Mart is even carrying them in some stores. There are more than 40 electric bicycle manufactures in the United States, including Autokam Ltd., in Scottsdale. 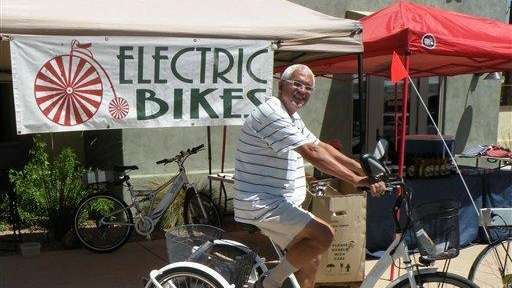 Fermin Cruz has been selling e-bikes at Green Valley farmers markets for about three years. Cruz, who lives in Tucson, say he started selling, repairing and modifying e-bikes when he needed a way to make up the losses he suffered in the stock market. "One day a friend of mine bought an electric bike and that turned a light [on] in my head and I decided to do some research," Cruz said. "I went to Shanghai, China, visited several different companies and I ordered all my products from them." His e-bikes range from about $750 to $2,200 and has sold about 200 in three years, selling more each year. Cruz said that many of his buyers have been older. Suzy Jenks, 69, of Green Valley, bought her e-bike to rebuild muscle that she lost due to a health condition. "It lets me exercise," Jenks said. Cruz thinks that the e-bike will be common in the United States by 2015. "Gas is a huge reason why they should become more common," he said. Mansfield expects to ride his e-bike about 300 days out of the year and go about 15 miles a day. That's a potential savings of about $450 in gas bills every year, not to mention saving on wear and tear on his car. He also could save on car insurance. E-bikes are considered the same as traditional bikes as long as they have a maximum speed of 20 mph, have functional pedals and have less than a 750-watt motor, or one horsepower. An e-bike doesn't require a license or special insurance in Arizona, but some parts of the laws vary from state to state. 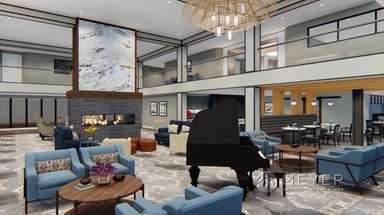 "If they are physically able then they should do it for the environment, cost saving and just for the fresh air," Mansfield said.